This is bizarre! Maybe Perikles was right ... that it's just to do with the carnaval! It's just a carnaval float, actually floating. That way, it is unlikely to burst into flames. Safety precautions. 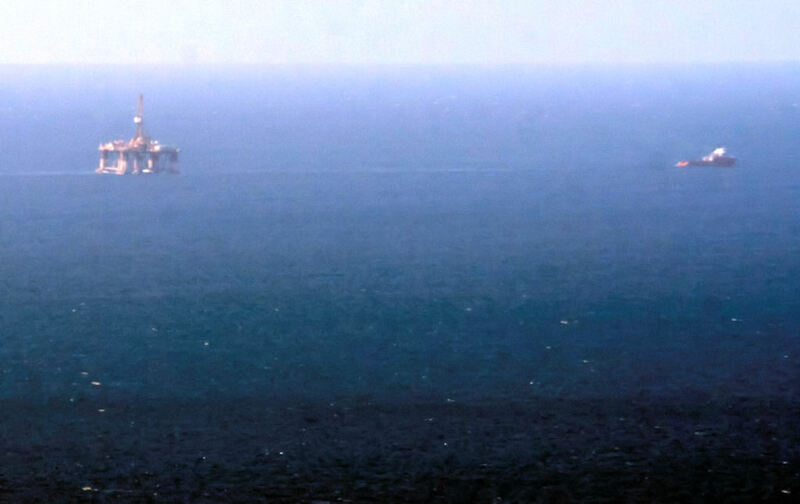 Here is a picture of the oil rig being towed in circles by the Pacific Champion. There is a little white dot just below the rig to the right, which is a sail boat, and seen through binoculars gives a good appreciation of the size of the rig. If you go to Marine Traffic and click on the turquoise ship off the southwest coast, heading approximately 255 degrees, then click on "show vessel's track" you can see it's just going in circles. Not that this explains any of the mystery! I've just emailed you the track ... here it is more clearly. What is it doing, it's been following this track for days now! Maybe someone has lost the anchor? Must be they are seartching for a drinkable waterwell under the sea than here . Here's my pic from this morning a it sailed(sic) by..